Marking a season of fresh beginnings and brand launches, Hyatt has announced the introduction of two new properties in UAE’s capital city: Hyatt Capital Gate Abu Dhabi and Grand Hyatt Abu Dhabi Hotel and Residence Emirates Pearl. 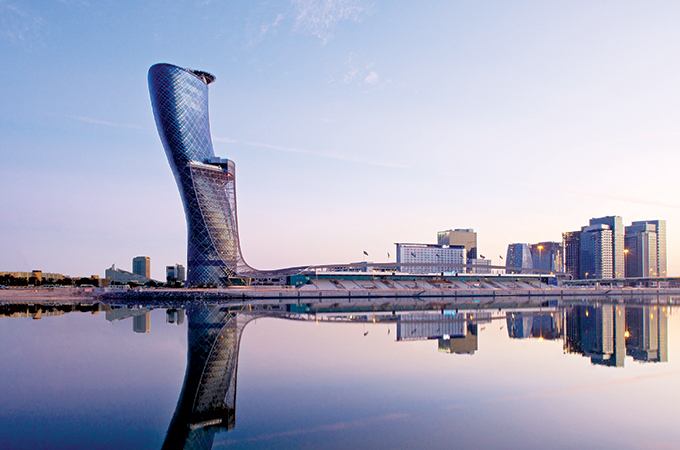 Hyatt Capital Gate Abu Dhabi will rebrand to Andaz Capital Gate Abu Dhabi, turning the iconic ‘Leaning Tower of Abu Dhabi’ into the first Andaz branded hotel in the Middle East. The hotel is owned by Abu Dhabi National Exhibitions Company (ADNEC) and is expected to be rebranded in late 2018. The property is near numerous noteworthy cultural, creative and entertainment offerings including Zayed Sports City and The Louvre, with the Sheikh Zayed Grand Mosque and Mangrove National Park just a short drive away. The hotel will feature a permanent art collection and various examples of unique craftsmanship such as “Khatt” calligraphy art and local, traditional “Sadu” weaving. Andaz Capital Gate Abu Dhabi will offer 189 five-star luxury guestrooms and suites, occupying the 18th to 33rd floors of the iconic Capital Gate building, marking the world’s furthest leaning hotel at an impressive 18 degree incline. Each room will offer panoramic views from floor-to-ceiling windows, its own unique art, and locally designed comforts such as the hotel’s bespoke Andaz Loungewear. The hotel is adjacent to Abu Dhabi’s National Exhibition Center and will feature a variety of restaurants and bars, an art gallery, a spa, as well as a rooftop swimming pool and fitness centre. The other impressive brand debuting in the capital under the Hyatt umbrella is Grand Hyatt Abu Dhabi Hotel and Residence Emirates Pearl. Located in one of the most architecturally striking buildings, in the heart of the capital, the iconic Grand Hyatt Abu Dhabi Hotel and Residences Emirates Pearl features awe-inspiring design and architecture, whilst incorporating a classic touch of timeless luxury. The hotel will be home to six restaurants and lounges, elegant and well-equipped event spaces, and numerous leisure facilities. Launching alongside the hotel will be limited room inventory, a 50m-infinity pool, including a kids’ pool and plunge pool, round the clock fitness centre, and two stellar restaurants: Verso and Pearl Lounge. A convenient 35-minute drive from Abu Dhabi International Airport and The Louvre Abu Dhabi, the luxury hotel is located in the corniche, offering generous beachfront promenades and stunning landmark city views including Emirates Palace, the Presidential Palace and the Founder’s Memorial. The property offers 332 rooms, 36 lavish suites, including the Presidential and Palatial Royal Suites, 60 full-service one and two-bedroom residences, ranging from 90 sqm to 140 sqm. The residences are open for tenancy.